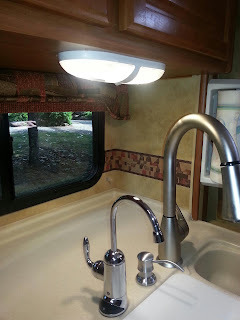 THE ROMANY LIFE: A New Water Filter In The Camper! A New Water Filter In The Camper! After trying a couple of different solutions, I think we have finally settled on the RIGHT one. I am talking about fresh drinking water filtration in the RV. One thing that we have learned from past mistakes, is to make good use of the freshwater tank on board. Keep it clean, use it all the time for drinking water and maintain it properly. The benefit is that we no longer have to buy and haul those expensive and cumbersome cases of bottled water for drinking. I won't even start on the subject about what they are doing to the environment, or how much clutter they create. Being able to pull water out of the tap for making coffee or drinking or cooking is a major convenience and there is no reason why it can't be done. Besides maintaining proper cleanliness of your freshwater tank, it is usually a good idea to filter water you are going to drink. This is especially true if you are travelling and filling your tank in various places. While most water you take from standard locations will be safe to drink, it often won't taste all that great. It will really mess up your morning coffee too! We get used to a certain taste for our water, and water filtration goes a long way to preserving that expectation. After losing our RV sink faucet in a freeze incident we needed to replace it. We replaced it with a low-priced domestic model from the local Home Depot. It has the popular pull-out faucet that is extremely handy when you're trying to maneuver in a tiny RV kitchen. This fix-it job left us with a much nicer faucet than we had before, and it also left us with TWO new vacant holes in our counter top where the old one used to be. I was DELIGHTED! I knew exactly what I was going to put in them; a water filter tap and a soap dispenser. The soap bottle would be one less thing on the tiny counter top, something I had in my house, and wanted in my RV. Now I do, and it's awesome. 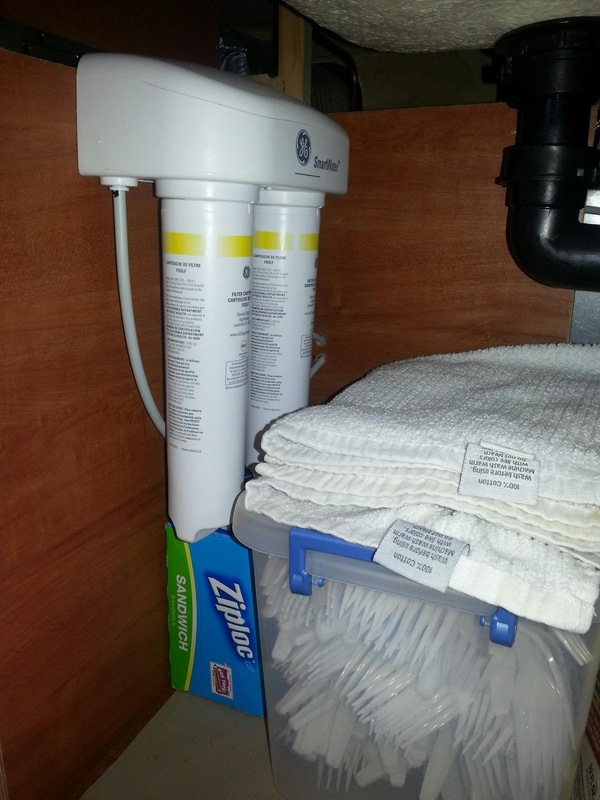 We mounted the filters for the water filter under the sink easily. They are compact and don't take up a lot of space. We are headed out on our big annual trip with 18 other families this weekend and I be putting it to the big test on it's first use... the place we are going has HORRIBLE tasting water. It even smells bad!! UPDATE: We are happy to report that the water filter is EXCEEDING our expectations! After an extended stay at a park with really poor tasting (and SMELLING) water, we can now say for sure that we are VERY thrilled with our new water filter! ONE LESS THING to remember to pack: Bottled water!!! Yay!